Fruit - globose, 5 to 6 mm. in diameter, dark purple to nearly black, capped by the withered flower. Type locality: Near Lagoa Santa, Minas Geraes; two localities were cited when first described, this being the first.. The plant has long been in cultivation, where it does well and blooms freely. Dr. Rose brought back a fresh supply from Brazil in 1915. According to Robert Lamb, the flowers have a perfume resembling that of a hyacinth. DISTRIBUTION. Brazil (Minas Gerais, Espirito Santo, Rio de Janeiro, Sao Paulo, Mato Grosso do Sul, Parana, Santa Catarina, Rio Grande do Sul), eastern Paraguay, Argentina (Misiones): epiphyte in seasonal forest, to 1100 m altitude. The lectotype is an unusually broad-stemmed form of the species and without knowledge of its provenance could easily be confused with the sister species, L. lorentzianum. 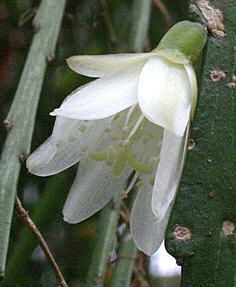 The supposedly white-fruited Rhipsalis linearis K. Schumann (l.c., Balansa 2500, K!, ) is treated as a synonym, since material so-named exhibits no obvious and reliable vegetative or floral differences. White fruits have not otherwise been seen in this species and raise suspicions that they were described in error or represented some sort of rare mutation. Flowers. lateral, rotate, c. 2 cm diam, green outside, white inside; Said to be hyacinth-scented. Habitat Brazil (Minas Geraes ; Sao Paulo). 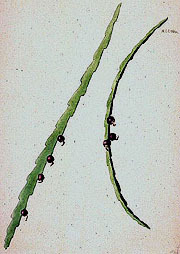 O GENERO RHIPSALIS por Albert Lofgren, Dos Archivos do Jardim Botanico, 1915.